"Contempt has always followed possession." 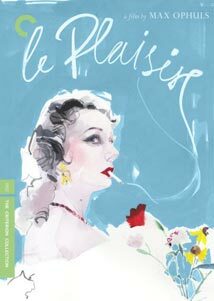 The allure of the short story for filmmakers is palpable—everything from Bringing Up Baby to Rear Window to Brokeback Mountain had their first incarnations as short stories, and with Le plaisir, you get the sense that director Max Ophuls is at least as interested in tone as he is in plot. The source material here is from Guy de Maupassant, and Jean Servais serves as a proxy for the author, providing narration and occasionally popping up in the story. (As with La ronde, this is clearly a favorite Ophuls narrative technique.) But this is no simply triptych—it's an effort to elicit a certain time and place, to provide a visual representation of Maupassant's subtleties, in a medium for which nuance isn't always a strong suit. Ophuls is masterful, though, and the stories are most compelling. The first is little more than a vignette—it starts at a grand ball, and though in black and white, looks like a Degas painting come to life. Forcing himself into the center of the action is a masked dandy, who revels rather a bit too wildly, hopping, groping, making merry, and soon it's clear why: the poor fellow passes out, and when a reluctant doctor is torn away from the sweet young thing on his arm to tend to him, he discovers that the masked fellow isn't a young stallion at all, but an old man, looking to recapture a dollop of the glory of his youth. The doctor takes him home, and learns that this is the old fellow's M.O. ; it's a poignant little tale, made more so by Ophuls' remarkably fluid camera, which glides through the party, over walls and up streets with a technical virtuosity that's particularly astonishing in a pre-Steadicam age. The meat of the movie—an hour of its running time—is the second tale, which centers on the activities at a high-end whorehouse. Or lack of activities, more accurately—the madame's young niece is about to take her first communion, so her auntie and auntie's girls make the trip to the country. Much of the focus is squarely on their regular customers, apparently typical bourgeois sorts terribly put out by a night without comfort in the arms of their favorite ladies of the evening—there's no moral outrage associated with prostitution, and Maupassant makes something like even Mrs. Warren's Profession seem hopelessly Victorian. Still, it's an odd sight to see six Paris hookers bunking down in the country, and the story gets its juice from the juxtaposition of the sacred and the profane. Especially notable here is the madame's brother, the farmer whose daughter's communion is being celebrated—he's played by Jean Gabin, perhaps the most dashing figure in French film history, though here he's the country bumpkin, not the city mouse. The final story, like the first, is both a poignant anecdote and a sort of bookend. It's the tale of an artist who, foolishly though predictably, falls head over heels for his model, and about what happens when he gets what he wants. As you might predict, it's about being careful what you wish for, and show what happens when success leads to recriminations, and the heat of first love turns lukewarm. And as with all of these stories, Ophuls twins passion with melancholy, and demonstrates an extraordinary grasp of both the technical elements at his disposal and the many, often contradictory impulses of the human heart. Image Transfer Review: Very tasty transfer, with inky blacks and modulated grays that make Ophuls' work compare with the best of Atget. Also, none of the abuse to the source print that's evident on the La ronde DVD. Audio Transfer Review: Given the limits of mono, an exemplary track, with little or no crackle, despite the limited dynamic range. Extras Review: No commentary track, but some informative extras on Ophuls' working methods. Director Todd Haynes (his most recent film is I'm Not There) provides what's sort of inappropriately called an introduction (17m:40s)—it's the video equivalent of one of those book prefaces that blows the whole plot for you, but still, Haynes is clearly a big Ophuls fan, and talks with intelligence and passion, especially about the last phase of Ophuls' career. Also included are two alternate narration tracks for the opening of the picture—one in English (by Peter Ustinov), one in German (by Anton Walbrook). Scholar Jean-Pierre Berthome is your host for From Script to Screen (19m:52s), which compares Maupassant's stories, Ophuls' screenplay, and the final film—most intriguingly, relatively late in development the director swapped out one Maupassant story and replaced it with the one that appears third in the feature. A trio of interviews from 1989 give us a sense of Ophuls at work, first with Daniel Gélin (12m:01s), who plays the artist in the final story; assistant director Tony Aboyantz (13m:29s), who was 20 at the time of the film's production (! ); and set decorator Robert Christidés (15m:17s), who gives a sense not just of what working with Ophuls was like, but of what a set decorator's daily duties consist of. And Robin Wood contributes an illuminating essay to the accompanying booklet. Ophuls found a kindred spirit in Maupassant, and this film is as much about the respect of one artist for another as it is about the uniquely enchanting tone that the director establishes.